This weekend we were on tour to Sweden, for a new tractor pull event at Sweden. The Malila Speedway hosted it's first tractor pull and with the swedish and some guest pullers we put down a not too bad show. The stadium is an EXCELLENT facility and the people working there also know what to do (they have a race there every week), just the track left something to be desired in the end (was ok in the beginning). Anyhow, they were happy and want the pullers back for some Euro Cup action next year. They will certanly work hard on the track for the future and I can imagine this place becoming a regular stop on the Euro Cup tour. I have uploaded the track pictures from the pull at Marilla NY. I have uploaded pit photos from Saturdays pull at Marilla NY. 2.5 ton eurocup vrije klasse Made's Powerweekend 2009 from PowerWeekend on Vimeo. 0,95 ton vrije klasse eurocup op Made's powerweekend from PowerWeekend on Vimeo. prostock eurocup op Made's powerweekend from PowerWeekend on Vimeo. I uploaded some pictures from the ESP sanctioned pull at Canandaigua NY. Then on the left under content click on PICTURES that will take you to the album. I have a new job from first of july on. I am going to work for Dostofarm in the, for them new, area of water purification and disinfection. It's a small, but very eager company and I will be doing the machine service and maintenance - world wide. So I will be on tour A LOT and busy as hell. For me this, of course, is a big challenge and opportunity I don't want to miss out on. So things will maybe get a little quieter on here. But in the past few weeks I have found people who are willing to help on this site and actually you all can help with placing your news on here, too. I don't want this site to die - but priorities in my life have changed in a heartbeat. Since I will be in the US a lot, I might be able to visit pulls over there, too and I probably will have the time to maintain the site, but the regular feeds, resulting on web research won't be possible anymore. I hope you understand this move - but pulling so far has not fed me very well and I am lucky there was people who knew me for all my life and think I can do this and gave me this job! This Ford is for sale in the classifieds by Bart vd. Berg. I am in Italy under the great service of the Starlight Express Team. Actually we wanted to go pull today, but I made the ultimate trip for a rain out. Instead we visited the Ferrari Museum and spent the day with their greatest pleasure.... FOOD. By now it's Grappa time. Anyhow, should be back home by monday night. TRACTOR PULLING ITALIA 3° prova RUSSI - RA- from massimo faietti on Vimeo. 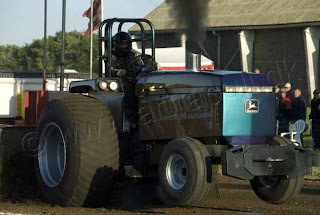 At www.ihc1455.de -> "Filme", there's two video clips of the Euro Challenge for Farm Stock tractors at Made! Heavy rain in the days up til the event but saturday the sun was out all day and nice warm weather , lovely . The track was a bit tricky again this year. After spending some time still at Made on monday and after wards some time in the Green Monster shop analyzing the engine settings of our 2.5t run and getting a set of new tires on my car, I just fell to bed yesterday night. I have now started with updating the website (as you can see below) and also the for sale section (which has a lot of stuff and even complete tractors on for sale now). Go to content on the left, click on pictures, that will take you to my gallery. Following previous correspondence (May 21) on multi turbine tractors and the article written by Burning Madness Team Captain in latest issue of Dutch TTPM on delay in progress of building the new BM II (5 turbines), hereby 2 pictures "revealing" actual status. Photos are free for publishing, small post would be nice. Foto for sale The Magic. Will you please put these foto,s to my for sale message on the for sale site on Pullingworld, I send you yesterday? I don,t know how to do it by my self. I have just opened my eyes after the Made tour... so sorry for the late reaction! The pictures need to be on a server. Anyhow, anybody looking for some entry in the modified division, check the for sale page (in a bit). We just did our first pull this year after some bearing problems. Only german, but a lot of pictures! So have a look an click on www.hotchili.de.tp !!! Bernay - what also happened!